This study documents a new method for translating fuel-specific emissions rates, or emissions in grams per kilogram of fuel burned, into distance-specific emissions rates, or emissions in grams per kilometer. This allows direct comparison of remote sensing measurements across vehicles with different fuel consumption. It also enables comparison of findings with emissions standards, chassis dynamometer testing, and portable emissions measurement systems (PEMS) testing. This study introduces a “vehicle family” definition and analyzes average remote sensing measurements by vehicle family. This method increases fleetwide coverage by grouping similar vehicles while continuing to separate vehicles by factors that can have a significant impact on emissions. 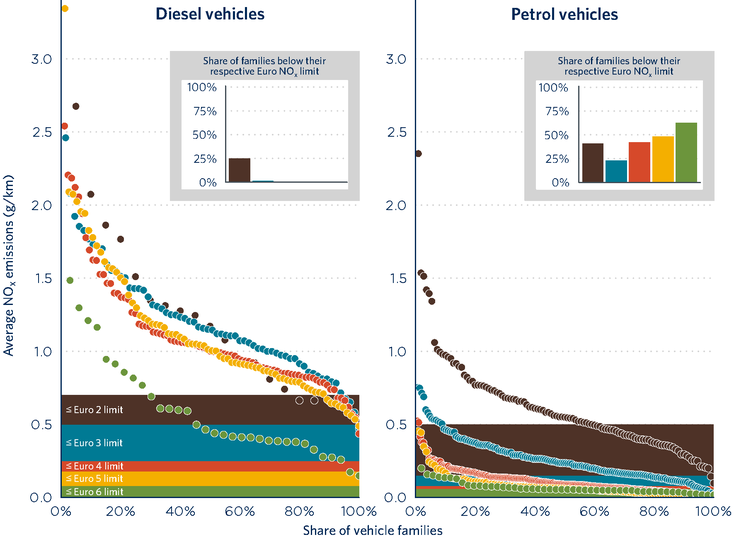 Analyses of remote sensing data support previous findings about the high real-world NOX emissions of diesel vehicles, with almost no reduction in NOX from Euro 2 to Euro 5. This suggests that deterioration of emissions control systems over time may not be a significant factor for diesels and that improper real-world emissions calibrations are the primary problem. By manufacturer group, Euro 6 petrol vehicle NOX emissions for even the worst manufacturers were within 1.5 times the type-approval limit. For diesel vehicles, even the best manufacturer group had Euro 6 NOX emissions of more than twice the type-approval limit, and all other manufacturer groups were at least four times the type-approval limit. Four manufacturer groups had average emissions of more than 12 times the type-approval limit. Almost no Euro 3 through Euro 6 diesel vehicle family had average remote sensing measurements below their respective type-approval standards. Euro 5 diesel families performed particularly poorly: All families had NOX emissions at least twice that of the limit, and the worst families had emissions 18 times the limit. Despite an average vehicle age of 16.4 years at the time of the remote sensing measurements, Euro 2 vehicles actually performed better, with 25% of the families still emitting less NOX than the Euro 2 limit. Even though diesel NOX limits were more than three times higher than petrol NOX limits for Euro 3 through Euro 5, petrol vehicles performed much better, as 23% of Euro 3 petrol vehicle families had average emissions below their respective standard, ranging up to 63% for Euro 6 petrol vehicle families.